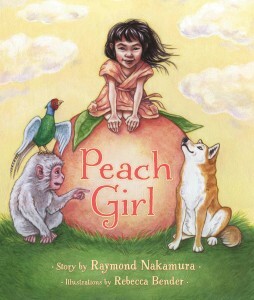 “In his engaging debut, author Raymond Nakamura puts a feminist bent on the Japanese folk tale Momotaro (Peach Boy). In Nakamura’s version, a young girl emerges from a giant peach discovered on the doorstep of an elderly couple (who are, notably, a farmer and her husband). Momoko, which translates as ‘Peach Girl,’ is a feisty creature determined to make the world a better place, a mission that involves ridding it of a child-eating ogre. Gently shrugging off her adoptive parents’ concerns for her safety, Momoko embarks on her quest with peach-pit armour for protection, plus a bundle of peach dumplings to eat on the way. “When a Japanese farmer and his wife see young Momoko push her way out of a giant peach, they immediately begin to care for her. Using various parts of the fruit, they provide her with clothing, protection, and food. ‘Peachy’ she declares, before she starts off to make the world a better place. As she journeys through the forest, looking for the ogre the couple warned her about, she meets a monkey, a dog, and a pheasant. Although each animal is frightened of the ogre who is bigger than a tree, has teeth like knives, and eyes that shoot flames, they agree to help Momoko for a serving of her peach dumplings. Although the trip is not easy (they have to build a boat) and their fear of the ogre never dissipates, the friends find the ogre’s house and make their presence known. When the strangers begin to talk with one another, they realize no one is as scary as they thought, and because they all love peach dumplings and good company, new friendships are formed. “…Vancouver-based educator and science blogger Raymond Nakamura’s feisty Momoko is a truth-seeking explorer who doesn’t let gossip about overbearing size, sharp teeth, burning eyes, much less cannibalistic tendencies, deter her from having fabulous experiences. Artist Rebecca Bender celebrates Momoko’s girl power, and makes sure to imbue our intrepid hero with energetic charm and never-flagging spirit. Cleary, we should all be so tenaciously broad-minded as we face the ever-changing wide world. That said, global improvement also includes paying attention to what’s closer to home. Momoko might be a fearless explorer, but she also doesn’t forget her daughterly duties: she’s quick to acknowledge and appreciate her parents’ enabling support by planning on bringing the oldsters along her next time out. A family that seeks together…has a much better time all around!